I'm not a fan of white background. Honestly, I never understood how it can becomed the standard. The fact that we are used to writing on white paper .. probable. Yes, but the sheet does not emit light! However everyone has his tastes. So I'm looking for a solution to change the background color of the folders. Recently I found How to change Background Color of Windows Photo Viewer. very simple, just set a register. Maybe there is a similar way to do the same to change the background color of the folders? If yes, where is the register? Given that dark mode being added to File Explorer in Windows 10 recently was a big deal, I'm guessing that it's not possible to change that in Windows 7. You're talking about Folders, so I assume you're referring to using Windows Explorer. I don't know if there is a way to just change Windows Explorer, but you can change the color of 20 some aspects of windows itself, through the personalize option. (I usually get to it by right clicking on the desktop and select Personalize). On the Personalize dialog, select "Window Color Slate", and then select the "Advanced appearance settings...", and you can change the color of all kinds of standard window elements. In, particular, set Window to Black, and your Folder background will be black. p.s. I guess that wasn't quite true. I guess I was changing the Window color on a machine that had one of the three High Contrast schemes that default to a black background. With that theme, you can change the window background color to other colors, beside the default black. But, black is probably what you want anyway, by the sound of it. I don't have Windows 7 on my machine, so I initially tested on my wife's machine and was able to change the background color, but that was because she has a high contrast theme selected because a light background is hard on her vision. p.p.s. Doesn't affect the Firefox browser background though, so this forum is still a light colored background, but that can be changed in the browser options itself. Last edited by passel; Feb 9th, 2019 at 09:58 PM. The obvious drawback is that that will change every application that uses that standard UI colour. Maybe that is desirable for someone who doesn't like a white background in general but I'd expect that some applications would not play nice with a setting like that. You'd also have to change the appropriate text colours so that you could read text over that window background. Actually it is a very absurd thing that MS did not foresee the possibility of customizing the colors to the user. (just a few). Then I did not really understand what's behind it ... changing shell32.dll and explorer.exe are things I'm not very confident of ... and I did not. If I want to set the folder background with a dark gray (not black), how do I do it? Last edited by reexre; Feb 10th, 2019 at 10:29 AM. Actually, as passel already pointed out above, Microsoft did provide a way for users to customize the colors of various Windows GUI elements. I believe it has been available since Windows 95. 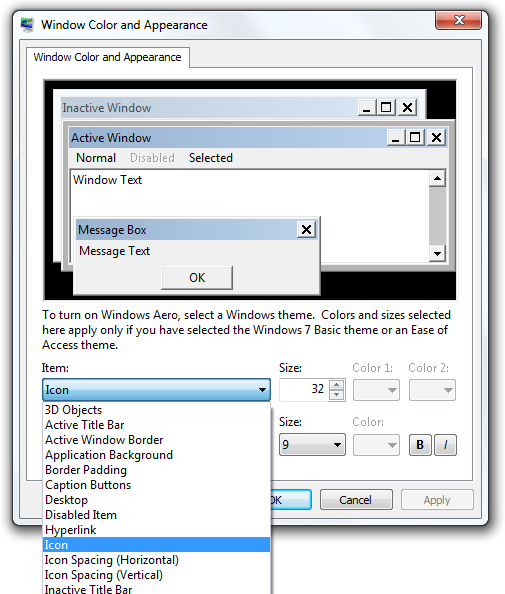 If you're using the Windows Classic theme or any of the High Contrast themes, you should be able to change the background color of most kinds of windows, including Windows Explorer, via the aforementioned Window Color and Appearance dialog. If you prefer to keep using any of the Aero themes, the only way you can alter the background color of most windows is by applying a custom Aero theme that you created yourself or downloaded somewhere. In other words, if an Aero theme is active, you can only change the background color through a custom Aero theme. If you're not using an Aero theme, specifying the background color can be done easily via the built-in dialog. 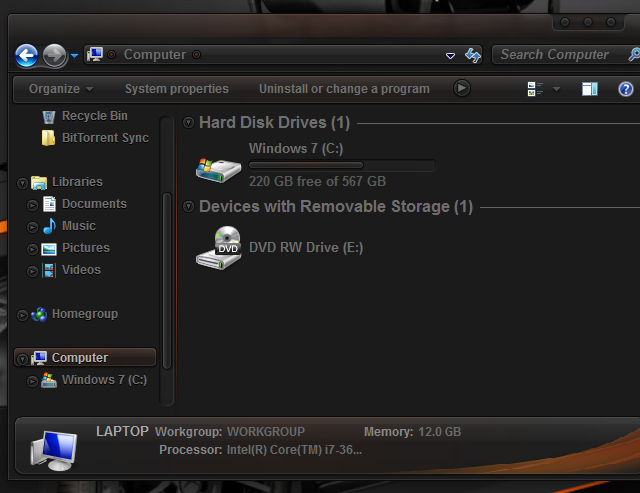 Yes, but with this dialog, no way to change Folder BackGround Color (or explorer as you call it) If I use Aero theme. And this is true only for Classic theme. I want to have Aero theme and change the background color of folders. I want to have the color I decide. could you give step by step concrete example ? Last edited by reexre; Feb 10th, 2019 at 05:13 PM. (maybe I have to create my custom .theme. If you're going to author your own Aero theme, be aware that it involves more than just writing a .theme file. You'll have to create an .msstyles file as well and reference it in the .theme file. See the [Visual Styles] Section of the Theme File Format topic and Wikipedia's article on MSSTYLES for more info. I don't know if Microsoft ever released a tool for making .msstyles files, but back in Windows XP, I used an .msstyles editor from StarDock. I'm not sure though if they released an updated editor for Vista/7. EDIT I see you've found another editor. I want to have Areo theme and change the background color of folders. You can't do it. As I've mentioned before, the background color can only be changed by applying an Aero theme that uses your chosen background color. The reason for this is because the background color (and the color of other GUI elements) is specified in the .msstyles file that is referenced by the .theme file. So, you can't do it unless using a custom .theme file. The problem with custom .msstyles files, however, is that they must be signed by Microsoft. So, if you want to use your own .msstyles file or a third-party one, you'll have to find ways to bypass the digital signature requirement. Two of the most popular workarounds are physically patching some system files (uxtheme.dll, etc.) and in-memory patching of those files. Physical patching risks corrupting the files and/or being wiped out by a system update while in-memory patching requires a (usually tiny) process running all the time. Quite difficult to find needed element(s). If anyone has tried it and has tips is wellcome.